The DOOM file size has been revealed via the official Xbox One store. According to the listing on the Xbox One Store, the DOOM reboot weighs in at more than 45GB – 45.04GB to be exact. The file size of the upcoming shooter on PS4 and PC hasn’t been revealed yet, but in general, sizes don’t differ that much between the 3 platforms. For reference, Ubisoft Massive’s The Division filled up roughly 32GB of space on your hard drive. In contrast, Halo: The Master Chief Collection required more than 62GB of free space, and Treyarch’s Black Ops 3 filled up your precious console with another 48GB of data. 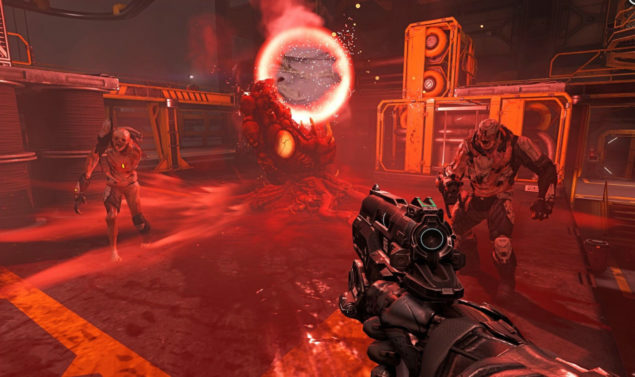 DOOM follows the story of a lone DOOM marine in a simple but yet lethal task – kill them all. The shooter will feature a campaign and multiplayer mode. Additionally, the DOOM SnapMap allows players to create, and edit their own maps. DOOM is scheduled for a release on May 13th for PC, PS4, and Xbox One. If you’re interested in some advanced DOOM PC settings, check out this post right here.